While the electric car is slowly being embraced by auto manufacturers and the public alike, the lack of charging stations has prevented it from fully being accepted by car-purchasing consumers. At the end of the day, no matter how much you love the planet, running out of juice with no charging point in sight is never appealing. Seeking to solve this quandary, Swiss company Nation-E recently unveiled the Angel Car, the world’s first mobile EV charging station. 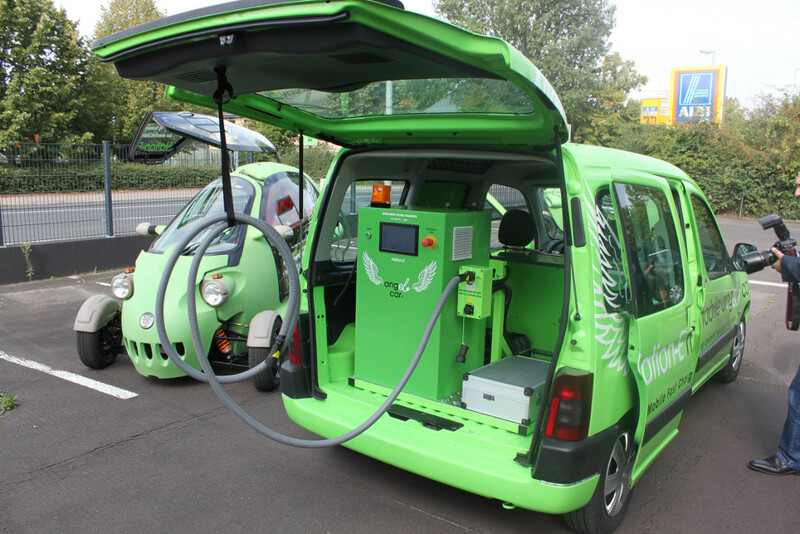 Located in the back of a van, the charging equipment is capable of being transported to wherever there may be a stranded EV owner. 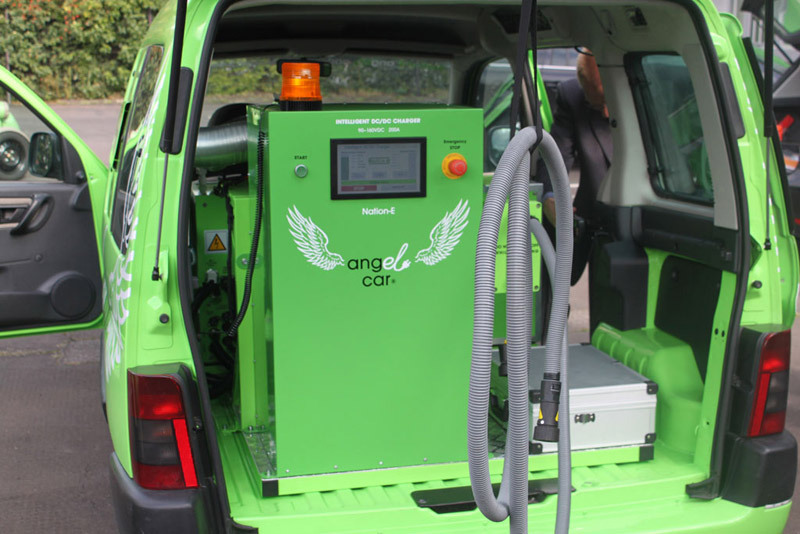 The mobile charging system is the first of its type in the world and can be installed on a dedicated Angel Car unit or on any standard service car. You also don’t have to wait hours for your car to be charged — the unit is equipped with an on-board 230V charger which is capable of juicing up a standard EV in about 15 minutes with 2-3 kWh of power. That’s enough energy for about 30km of travel, which should allow them to get to a standard EV charge point or back home. “The communication between the stranded vehicle and the Angel Car is facilitated through Nation-E’s high-end Battery Management System. This system is capable to converse and examine the parameters and the verification permits of the car battery, and determine the quantity and intensity of energy that should be fast-charged into the stranded vehicle. This hyper intelligent unit is equipped with a touch screen that enables the controlled flow of energy,” Nation-E says in a statement. That may be true, but if the electric car is truly to be embraced by the public then a huge development of infrastructure is going to be needed. Since there’s not that many EV charging points outside of forward-thinking cities like San Francisco and New York, the car of choice for the environmentally-minded remains the Prius. Is there such a thing as an electric service station? Dear Timon, There\'s no mention of the second most important aspect of this article; the little 3 wheeled electric car in the photo! It looks incredible! What is it? Would you please do an article on this car!? Thanks! While the electric car is slowly being embraced by auto manufacturers and the public alike, the lack of charging stations has prevented it from fully being accepted by car-purchasing consumers. At the end of the day, no matter how much you love the planet, running out of juice with no charging point in sight is never appealing. 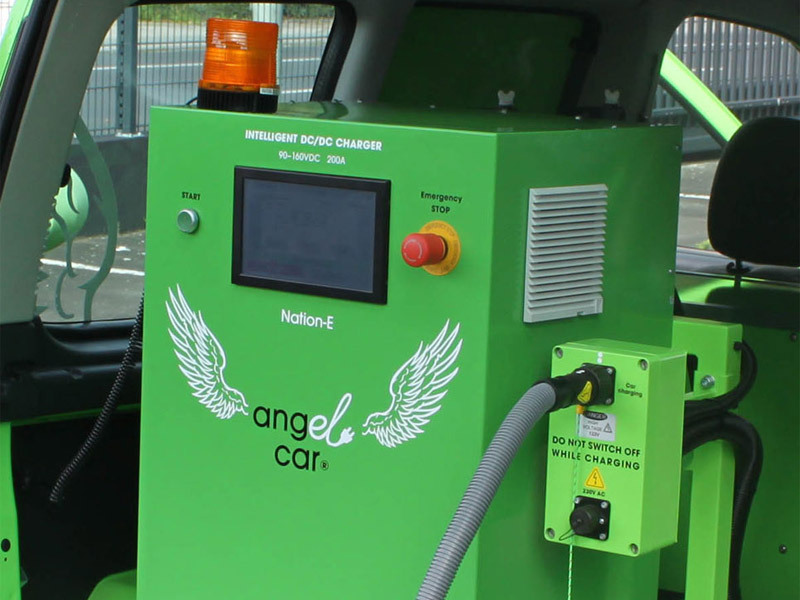 Seeking to solve this quandary, Swiss company Nation-E recently unveiled the Angel Car, the world's first mobile EV charging station.